There are growing expectations for economic cooperation between South and North Koreas in line with an improving inter-Korean relationship following historic summits between leaders from both Koreas and between North Korean leader Kim and US President Trump. Discussion is underway over joint economic projects including the reconnection of inter-Korean railways and the reforestation of North Korea. Since Inter-Korean economic exchange and cooperation started in 1989, trade volume had been on the rise. In particular, the establishment of the Kaesong Industrial Complex sparked interest in investment in joint projects among South Korean businesses. 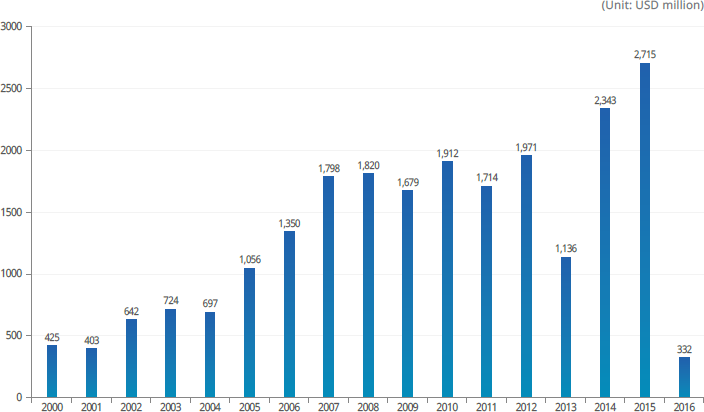 Inter-Korean trade volume hit an all-time high of USD 2,715 million in 2015, one year before the complex was abruptly closed due to political tensions surrounding North Korea’s missile test. A total of 474 trade deals had been made between the two Koreas since 2000, and 82 percent of which involved the Kaesong Industrial Complex. Under his "new economic map for the Korean Peninsula," South Korean President Moon envisages the expansion of economic cooperation between the two Koreas. Specifically, the initiative focuses on building three major economic belts - East Sea Economic Belt, West Sea Economic Belt and Border Area (DMZ) Economic Belt. 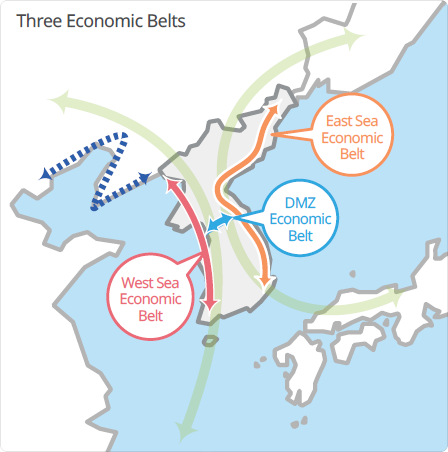 These economic belts will be designed to promote balanced economic development of the Korean Peninsula and to strengthen regional connectivity based on a railway system that connects the peninsula to Russia, China and Europe. Energy and overland transportation are the two most central features of the new vision. When a trans-Korean gas pipeline is constructed, Russian gas can be transported through the pipeline via North Korea down to South Korea. Moreover railway links from the South to the North and beyond will enable inland freight to be transported from southernmost coastal cities on the Korean Peninsula all the way to major cities in Europe. One of the key obstacles to the expansion of inter-Korean economic engagement is sanctions on North Korea. Under the current international sanction regime against North Korea, transactions with North Korea is largely restricted. It is thus important to lay the groundwork toward lifting the economic sanctions. An essential prerequisite for inter-Korean economic cooperation would be significant progress in U.S. negotiations with North Korea over its denuclearization since no sanction is likely to be lifted unless North Korea gives up its nuclear program. Another challenge is to generate public consensus on the need to pursue inter-Korean economic cooperation. Without full support from the public in the South, it would be difficult to make cooperative projects successful.